I just don’t know when I’m going to have time to get all my errands done. It would be so nice to take a long walk. Or even a long nap! I really wish I could spend some time catching up with my friends. If you’re a dementia caregiver, you may have spoken these words a time or two. And for good reason! Everyone deserves a break, especially those family caregivers who devote so much time taking care of a loved one with Alzheimer’s or dementia. Respite care allows you to take temporary time off from your responsibilities as a primary caregiver so that you can focus on yourself for a while. It also ensures that your loved one living with Alzheimer’s or dementia continues to receive the care they need in a safe, supportive and familiar environment. Using respite services can strengthen and enhance your ability to be a dementia caregiver. It also can give you comfort and peace of mind knowing that your loved one is spending time with another caring individual. But making the decision to use respite care can be tough. You may feel guilty about bringing someone else in to help, especially if you believe you can and should “do it all.” But if you don’t take an occasional break, you can become frustrated, depressed and even ill. And if that happens, you might not be able to take care of your loved one at all. You may think respite care is too expensive. The cost of respite services can vary greatly depending on the level of care that is needed. 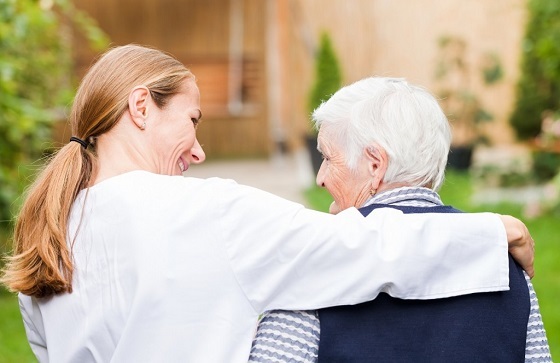 While cost should be considered, remember that respite services are meant to be a short-term solution that can benefit both the dementia caregiver and the person needing care. Those benefits can often outweigh the costs. You may be concerned about the dependability of a professional caregiver. However, those who work for an agency or facility should be reliable, qualified and well trained. For example, FirstLight caregivers are direct employees (not contractors), state-licensed where required, and thoroughly screened with a corresponding background-check. They also must pass through our rigorous in-home care training. Additionally, after our thorough recruitment and home care training, all employees must go through our unique Culture of Care training and orientation process. If you’re not sure about bringing in respite care, really look at your options. Can friends or family step in to help for a while? Look at in-home care providers. Your local aging agency or the Alzheimer’s Association may be able to offer advice on resources. Consider bringing in care for short amounts of time to test it, get comfortable with it and see if it fits your situation. Make sure the respite caregivers you bring in are trained in dementia care. Caring for those with dementia is challenging unless you are equipped with specialized training and tools to effectively assist those living with the disease. FirstLight Home Care provides a comprehensive memory care training plan for its team members to ensure the services provided to dementia clients are as unique as the individuals they were designed for. Our memory care practitioners are certified by the National Council of Certified Dementia Practitioners, LLC, and they utilize this training in developing specific care plans for clients with dementia. We provide quarterly training and certification, online and on-site, for caregivers and client family members. Our memory care experts develop meaningful connections with the people they serve. We understand that who they are – and who they’ve been – impacts how they talk, act, remember and behave when living with dementia. Learn about the many Respite Care Services FirstLight can provide, as well as our personalized Dementia Care Services.